Last winter, birders and photographers alike reveled at the appearance of an unusual Arctic guest. For wildlife photographer David C. Olson, this rare visit offered the chance of a lifetime, as he spent weeks in the frigid, snowswept farm fields of McHenry and Cook counties. The snowy owl has keen hearing and even keener eyesight, skimming silently along the ground in order to surprise its prey. This owl has been attracted by a sound or movement and is banking toward it. The feathers of the left wingtip are actually brushing the top of the snow. The snowy owl normally lives in the high Arctic regions of Canada and Alaska. Each winter, a few make it down to the Midwest, and snowy owl sightings in Illinois always cause a stir. Periodically, a somewhat larger number will show up in the upper Midwest and Pacific Northwest, and along the eastern seaboard, but this only happens every five to 10 years. In fact, in birders’ terms, a snowy owl is referred to as a “lifer,” a species of bird Midwesterners may get a chance to see only once in their lives – without traveling to the owl’s natural habitat up north on the frozen tundra. That is, until the winter of 2013-2014, when a much larger number of snowy owls than usual appeared in some areas in the lower 48 states – some as far south as Hawaii. Hundreds were reported in the Upper Midwest alone. This event is not an owl migration. This is an owl irruption. A migration is a predictable or annual event, in which the birds leave their home ranges at a predictable time, such as the end of summer or fall, and move to warmer climates. Then, come spring, they journey back to their northern homes. In ecology, an irruption (not to be confused with eruption, like a volcano) is a rapid increase in numbers within a species. Irruption is not annual, regular or even predictable. The snowy owl’s diet consists of voles and lemmings, small rodents found in the Arctic, and some birds. Traditionally, an acute food shortage causes these movements, but over the past few years, studies have shown that lemming populations in the Arctic are at an all-time high. With this abundance of food, the owls have been able to reproduce at record numbers, and this high population of owls has led to a natural dispersal of birds out of their home ranges..
We know that these birds are among the world’s great avian nomads, ranging thousands of miles across the Arctic. The majority of the irruptive birds that came south in late 2013 were juveniles. The reason is that older birds stayed farther north, closer to their established breeding grounds. With plenty of available prey in the summer months, mating owls successfully fledged more owlets than usual. Once fall arrived, however, the older birds asserted their claim on the hunting grounds, and youngsters decided to try their luck farther south – lucky for you and me. This winter, we’re still seeing increased numbers of snowy owls, but not as many as last year. Other parts of the nation are also reporting record numbers of snowy owls. Once established in an area, the owls often stay put until the end of winter. Come spring, they’ll return to their home range in the Arctic and to their breeding grounds on the tundra’s surface. The snowy owl, unlike most owls, is diurnal rather than nocturnal – it’s active and hunts during daylight hours. It prefers large open fields that resemble its natural habitat up north, in the arctic tundra of Canada and Alaska, where it both hunts and roosts. In fact, it’s more comfortable on the ground than a high perch – most likely because there are no high perches on the tundra. The snowy owl’s eyesight is so keen that it can see the slightest movement of a mouse in the snow from as far away as a mile. The fluffy feathers that cover the bird’s feet camouflage deadly curved talons. 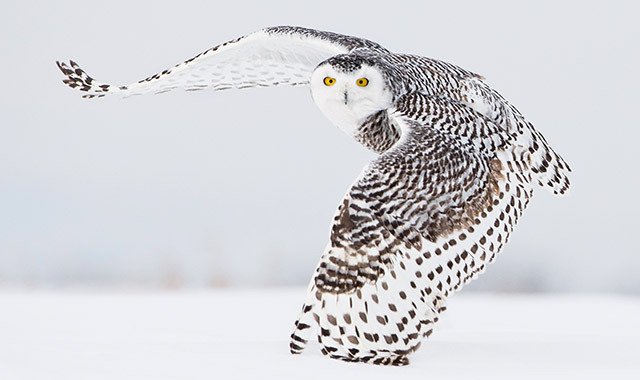 Known as the “Ghost of the Arctic,” the snowy owl swoops silently and swiftly in on its unsuspecting prey, kills it with its talons and swallows it whole. It prefers lemmings, consuming up to six a day, but anything that fits in its talons is fair game, from rabbits and pheasants to waterfowl and fish. With a wingspan up to six feet, the snowy owl is one of the largest species of North American owls, and can attain speeds up to 50 mph. Mostly white, it has differing amounts of black and brown markings on its back, chest and wings, which fade as the owl ages. Mature males tend to be mostly white, while females retain some salt-and-pepper coloring. For a photographer, searching and locating a white bird in a vast area of white snow isn’t easy, and frigid temperatures of 20 degrees below zero don’t help. One particular week, I spent more than 30 hours outdoors in windy and sub-zero weather, searching for the owl. The arctic conditions we had last winter made working with cameras difficult. I was photographing a very stealthy and shy bird that loves flat, open spaces that resemble the treeless landscape of its arctic homeland; I had to use patience and knowledge of bird behavior to understand and predict its daily activities. Most importantly, I needed to have proper camera techniques to consistently capture good flight images that happen in a blink of an eye. The near-daily white-out conditions made it very hard to expose perfectly – I was metering constantly. Focusing was also tricky – photographing a white subject against a white background made it hard for the lens to hone in on the owl, especially when in flight. Luckily, I’m very seasoned at this technique, and I believe I captured them in all of their essence. I was also able to capture some unusual behaviors of this charismatic and beautiful owl. It’s an honor to share the beauty of this bird, in its natural setting, through my photography. This entry was posted on Wednesday, January 28th, 2015 at 11:59 am	and is filed under Features, Top Posts. You can follow any responses to this entry through the RSS 2.0 feed. Both comments and pings are currently closed.